Aware is a sustainable fashion brand by Printa. Aware kids is something I’ve been dying to see from Zita for ages. And I love it. It is comfy, cool and has a low carbon footprint. The collection is based on geometric shapes inspired by Tangram – ancient Chinese puzzle like game. According to one legend a young Chinese was sent by his master to travel the world and to record everything he sees with a square mirror he received. During the trip the mirror broke in 7 pieces, and with the seven pieces he managed to build figures to illustrate the trip. Similarly to the idea of Tangram, Printa’s designer Zita Majoros sees beauty in the ‘broken’ , used and thrown away. 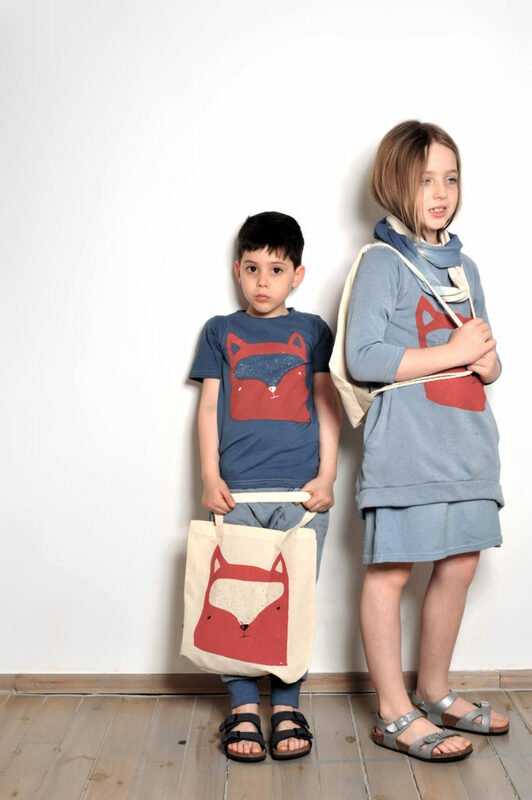 Aware kids collection is made of recycled cotton waste. We were careful with choice of color. We used the natural color of cotton as a base of hand painted it in different shades of blue. We use more sustainable water based paint for silk screen printing and try to incorporate this idea throughout our production process. This is Blanka, Zita’s 8 year old daughter. She is an avid drawer and already has her own collection. We also find it very important to teach our kids about sustainability from young age, and what we wear plays an important part.